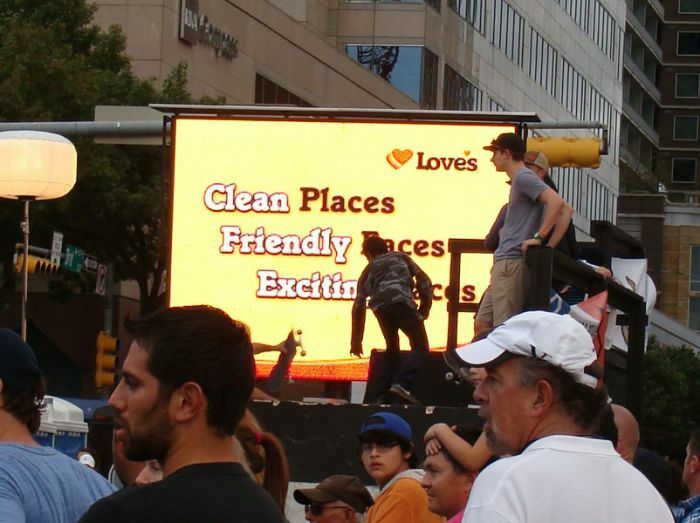 Zephyr Media Inc. partnered with BrightSign to deliver a high-impact Digital Out Of Home (DOOH) advertising network for Austin Fan Fest 2013, the interactive festival that runs in parallel with the Formula One 2013 United States Grand Prix. The four-day festival – which occupies 12 square blocks in historic downtown Austin – includes dozens of interactive and educational displays, as well as dining, entertainment and live music at every turn. Festival attendees are drawn by activities for all ages. The event includes six stages hosting countless activities for children, families and race fans, including some of music’s hottest acts, an X-Games action sports zone, food trucks, and F1 race car simulators and interactive exhibits. With four HD Mega screens measuring 12 by nine feet and the USA’s largest mobile 16:9 HD Jumbo screen at 19 by 33 feet, Zephyr Media created a powerful DOOH network. The screens effectively target a captive, engaged audience in excess of 300,000 people, taking advantage of extended dwell times, to provide a high-impact advertising opportunity. For event sponsors, Austin Fan Fest 2013 delivers a captive audience of elite motorsport fans in a festive mood – individuals with a high level of disposable income. Zephyr Media’s DOOH network takes advantage of this dynamic, engaging market and enables advertisers to successfully target this audience. The ability to generate awareness and build brand exposure and preference at this and other outdoor festivals has grown exponentially in the past few years – growth that is directly attributable to advances in DOOH technology and deployment. With nearly $60 million spent on shopping and entertainment during Formula One week, and an average individual fan spend of more than $1,500, the Austin Fan Fest Digital Media Network Powered by Zephyr Media provides one of the most direct and effective methods for advertisers to reach a high-spending, fully engaged elite motorsports audience. While Zephyr Media’s DOOH Network was conceived initially to deliver high-impact advertising for event sponsors, the network will also be used as part of a pro bono effort to raise awareness for relief efforts currently underway in the Philippines, following the typhoon that recently devastated parts of that country. The Digital Screenmedia Association created a number of 15-second public service announcements that include instructions on how to easily donate to the relief effort. One of those 15-second spots will run twice during each 45-minute segment for three days, displayed on a High Def 16:9 screen that measures 33 feet across. This is the largest screen at the event and is visible from nearly a quarter mile away. Zephyr Media will run the spots free of charge using BrightSign’s players, filling the urgent need to generate exposure and donations to provide typhoon survivors with water and other critical care items.